Background Reperfusion arrhythmias can occur within seconds of restoration of blood flow to previously ischaemic myocardium. Heterogeneities and abrupt changes in both gap junctional coupling and action potentials during early reperfusion are thought to contribute to their pathophysiology. We tested the hypothesis that modulating gap junctional coupling can reduce the incidence of reperfusion arrhythmias, and used optical mapping to assess the mechanisms of any anti-arrhythmic effect. Methods Using a Langendorff apparatus, rat hearts were perfused with either 50 nM AAP10 to increase gap junctional coupling (n=10), 30 μM carbenoxolone (CBX) to reduce coupling (n=13) or control Krebs-Henseleit solution (n=10). Hearts were then subjected to regional ischaemia by occlusion of the left anterior descending artery for 8 min and then reperfused. Ventricular arrhythmia incidence was documented. For optical mapping experiments, a further eighteen hearts were loaded with a voltage-sensitive dye (RH237), perfused with an excitation-contraction uncoupler (10μM blebbistatin) and either AAP10 (n=6), carbenoxolone (n=6) or control (n=6), and then subjected to ischaemia and reperfusion as above whilst transmembrane voltage (Vm) transients were recorded. 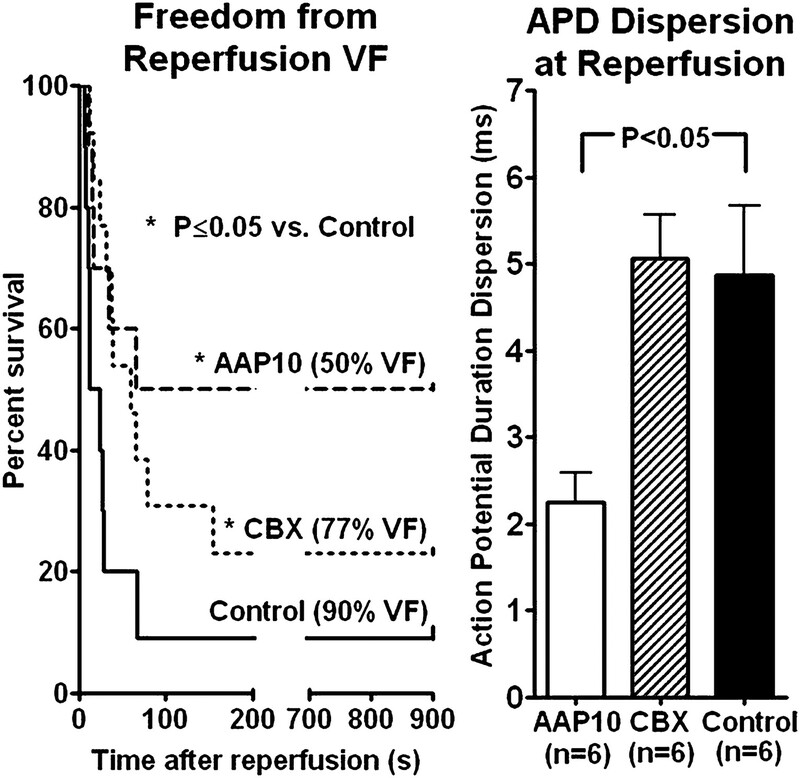 Results Both AAP10 and CBX reduced the incidence of reperfusion VF (AAP10 50%, CBX 77%, Control 90%) and delayed time to onset of reperfusion VF (AAP10 29.0±9.9 s; CBX 52.2±13.2 s; Control 21.8 s±6.4 s) (LogRank p<0.05). AAP10 reduced the dispersion of action potential duration (APD) in ischaemic myocardium (AAP10 2.3±0.8 ms; CBX 5.1±1.2 ms; Control 4.9±2.0 ms, p<0.05). AAP10 also improved conduction across a 0.6 cm2 central ischaemic zone in the anterior left ventricle (LV) (Activation time: AAP10 15.3 ± 1.3ms; CBX 25.7 ±2.2 ms; Control 23.2±2.0 ms, p<0.05) immediately prior to reperfusion. 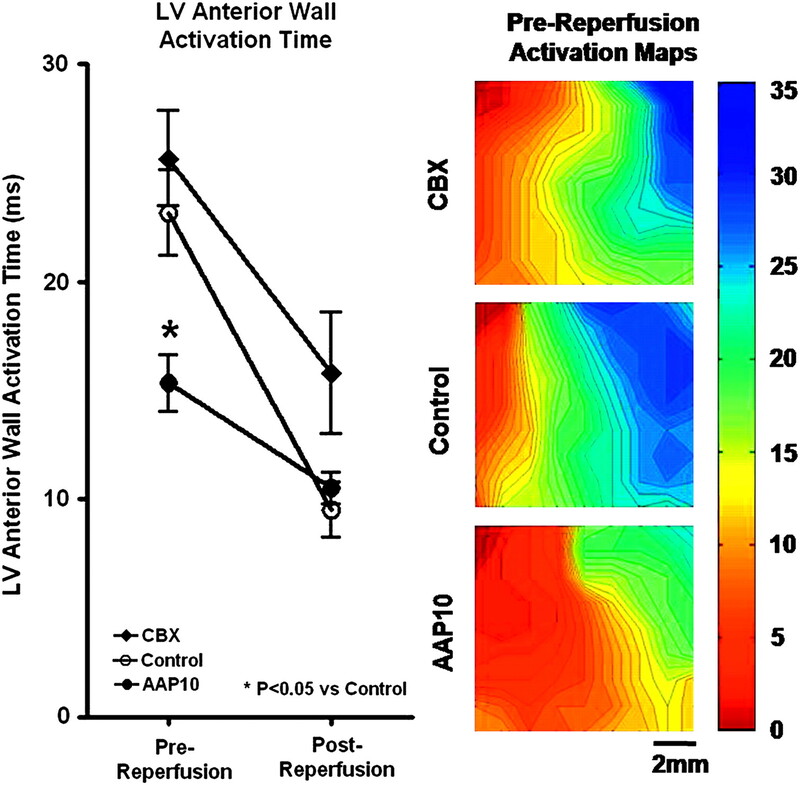 CBX slowed conduction and prolonged this activation time post-reperfusion (AAP10 10.3±0.8 ms; CBX 15.8±2.8 ms; Control 9.5±1.2 ms), thus resulting in smaller changes in conduction velocities pre- and post-reperfusion compared with control. Conclusions Both increasing and reducing gap junctional coupling, with AAP10 and CBX respectively, reduced the rate and delayed the onset of reperfusion VF. This suggests that the partial uncoupling that occurs during early reperfusion is a determinant of reperfusion arrhythmias, and that both normalising the degree of coupling or further exacerbating uncoupling may be anti-arrhythmic. The anti-arrhythmic effect of increasing gap junctional coupling may be mediated by its dual effect of reducing action potential heterogeneity and improving conduction during reperfusion. Further uncoupling may be protective via attenuation of the abrupt changes in coupling and conduction that occur at reperfusion following ischaemia. Freedom from reperfusion VF. APD dispersion at reperfusion. LV anterior wall activation time (ms).